Guadalcanal.7 As daylight broke, the islands lay quiet. The Japanese were taken by surprise; not one shot had been fired at the Amphibious Force. The initial Allied landing in the Solomon Islands, which preceded those on Tulagi, Gavutu, and Tanambogo, was made by a covering force. (Map 2) Supported by fire from the cruiser and destroyers of the Tulagi Fire Support Group and the minesweepers, landing boats put B Company of the 2d Marines ashore near Haleta, a village adjoining a promontory on Florida Island which commands Beach Blue on Tulagi.11 The remainder of the 1st Battalion of the 2d Marines landed at Halavo on Florida to cover the landings. No enemy forces opposed either landing, and the battalion was later withdrawn. TULAGI ISLAND, photographed 7 August 1942 during a pre-invasion bombardment. Florida Island is in the background across Tulagi anchorage. LANDINGS ON FLORIDA ISLAND were made by 2d Marines without opposition. 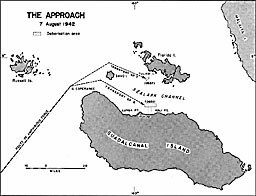 By late afternoon it had become obvious that the raiders could not complete the capture of Tulagi on 7 August, and the battalion established a defensive line about 1000 yards from the southeast tip of the island. 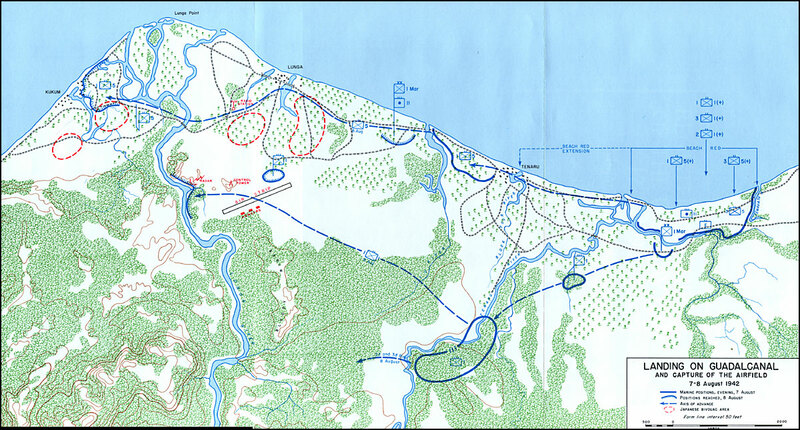 The five raider companies and G Company of the 5th Marines occupied these positions, which the enemy attacked repeatedly but unsuccessfully throughout the night of 7-8 August. GAVUTU and TANAMBOGO, photographed on the afternoon of 7 August from the northeast, were taken after heavy fighting. Fires in a warehouse area on Tanambogo were started by bombardment before the unsuccessful first attempt to capture the small island. THE SOUTHEAST END OF TULAGI was heavily defended by the enemy dug into the steep hillsides and ravines. On the hill, center, are two antiaircraft positions and at right, the prison. Marines' attack came from the left of the picture. reducing Tulagi, the islets of Gavutu and Tanambogo, lying 3,000 yards to the east, also saw hard fighting. Gavutu is 250 by 500 yards in size and Tanambogo, a slightly smaller island, is joined to Gavutu by a 300-yard-long concrete causeway. Dive bombers (SBD's) attacked Gavutu from 1145 to 1155 on 7 August. The Tulagi Fire Support Group shelled Gavutu from 1155 to 1200 to cover the 7-mile approach of the thirteen landing craft bearing the 1st Parachute Battalion to the seaplane slips and jetties on Gavutu's northeast corner. The bombardment had knocked several large concrete blocks from the ramps into the water, and the parachutists were forced to land at the docks and mount them in face of enemy small-arms fire. The first wave reached shore safely, but succeeding waves were hit hard, about one man in ten becoming a casualty. By 1400 the parachutists were advancing inland under fire from the Japanese emplaced on the island's single hill and on near-by Tanambogo. By 1800 the battalion had secured the hill and raised the national colors there. The Japanese retained possession of several dugouts until the afternoon of 8 August, when they were reduced by the parachutists and two companies of the 2d Marines. In spite of air bombardment and naval shelling, the Japanese on Tanambogo continued active on 7 August. After being withdrawn from Haleta, B Company of the 2d Marines attempted to land on Tanambogo's north coast after a 5-minute naval bombardment, but the attack failed. About 1130 the next day, the 3d Battalion of the 2d Marines and two light tanks attacked Tanambogo from the beach and the causeway and secured most of the island by late afternoon. By nightfall all the Japanese were dead. Marine casualties in the Tanambogo-Gavutu attacks had been relatively heavy; 108 were dead or missing, 140 wounded. The marines later estimated that nearly 1,000 Japanese had held Gavutu and Tanambogo, but the actual figure was about 500. Beach Red, which lies about 6,000 yards east of Lunga Point, between the Tenaru and Tenavatu Rivers, had been selected for the Guadalcanal landings. MARINE LANDINGS ON GUADALCANAL were made from transports anchored 9,000 yards off Red Beach. Smoke from preliminary shelling still obscured the beach. 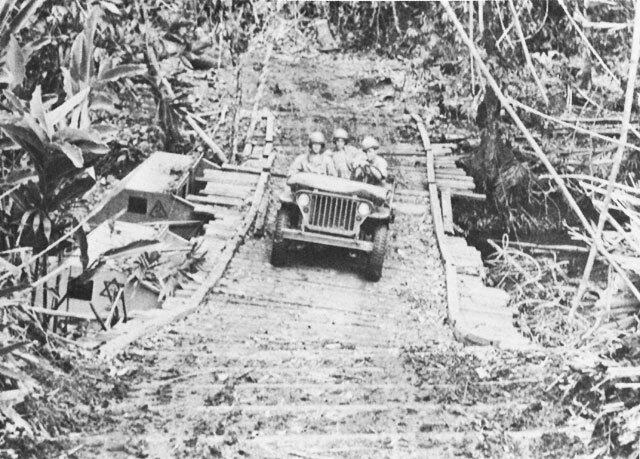 BRIDGING THE TENARU RIVER, amphibian tractors were used to support the flooring as the Marines moved to expand the beachhead 7 August. The transports of Group X initially anchored 9,000 yards off Beach Red on the morning of 7 August. The destroyers of the Guadalcanal Fire Support Group took their stations 5,000 yards north of the beach at 0840 to mark the line of departure for the landing craft. 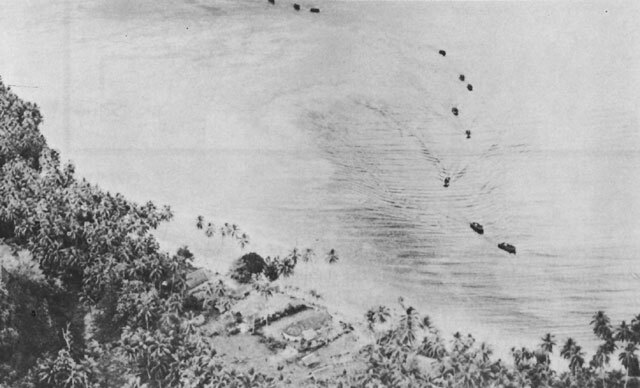 The assigned liaison planes made eight runs at low altitudes to mark the extremities of the beaches with smoke.16 The three cruisers and four destroyers of the Guadalcanal Fire Support Group began firing at 0900, to cover a 3,200-yard-long area from a point extending 800 yards on either side of Beach Red to a depth of 200 yards. The first wave of landing craft, carrying troops of the reinforced 5th Marines (less the 2d Battalion), crossed the line of departure 5,000 yards off Beach Red. As the landing craft drew to within 1,300 yards of the beach, the warships ceased firing. There were no Japanese on the beach. The marines went ashore at 0910 on a 1,600-yard front, the reinforced 1st Battalion on the right (west), the reinforced 3d Battalion on the left. Regimental headquarters followed at 0938, and by 0940 heavy weapons troops had come ashore to act as regimental reserve.17 All boat formations had crossed the line of departure promptly and in good order, and had reached their assigned beach areas.18 The assault battalions of the 5th Marines then advanced inland about 600 yards to establish a beachhead perimeter bounded on the west by the Tenaru River, on the east by the Tenavatu River, on the south by an east-west branch of the Tenaru, and to cover the landings of successive units. When the assaulting regiments and their supporting pack howitzers were ashore, the advance toward the airfield was ready to begin. 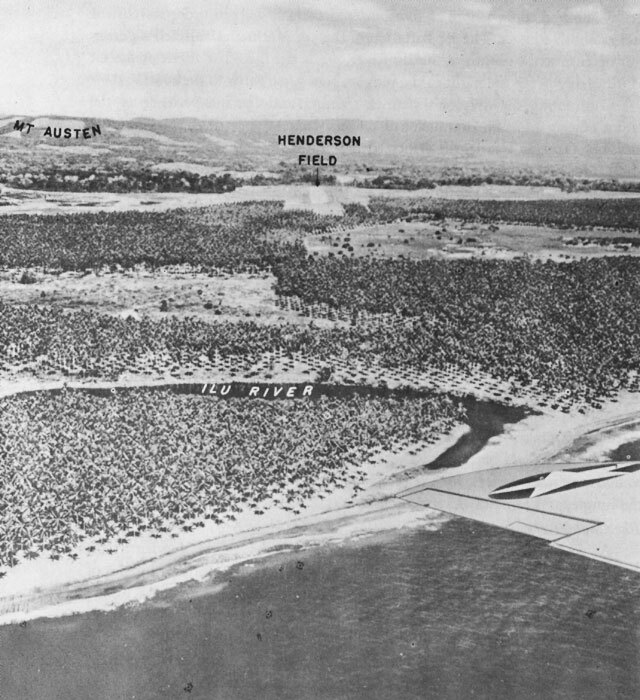 The 1st Battalion of the 5th Marines was to advance west along the beach toward the Lunga River while the 1st Marines attacked southwest toward Mount Austen. The 3d Battalion of the 5th Marines, the artillery, engineer, pioneer, and special weapons and defense battalions were to hold the beach during the advance. At 1115 the 1st Marines passed through the 5th Marines' lines. Engineers put a temporary bridge upstream on the Tenaru, using amphibian tractors as pontons. The 1st Marines crossed the river and turned southwest toward Mount Austen. On the beach the 1st Battalion of the 5th Marines crossed the mouth of the Tenaru at 1330 and marched toward the Ilu. Neither regiment met any Japanese. At 2000, when 10,000 troops had come ashore,27 General Vandegrift ordered the 1st Marines to attack toward the Lunga the next morning instead of taking Mount Austen. He recognized that Mount Austen commanded Lunga Point, but because it was too large and too far away for his relatively small force to hold he decided not to take it immediately. THE LUNGA POINT AIRFIELD and Mount Austen photographed from the air over the mouth of the Ilu River west of the Red Beach landing area two weeks after the initial invasion. front. General Vandegrift, then convinced that his division was not faced by a sizable organized force on Guadalcanal, ordered the battalion to contract its front, cross the Lunga River, and seize Kukum village before nightfall. By 1500 the advance guard had traveled almost 6,000 yards to overrun a small party of Japanese firing rifles and machine guns from knolls on the outskirts of Kukum. Kukum, containing one 3-inch antiaircraft gun, one 1-inch antiaircraft gun, two 37-mm. antitank guns, and heavy machine guns, was otherwise undefended. Besides the runway and the weapons in Kukum, the Japanese had abandoned a store of .25-caliber rifles, .25- and .303-caliber machine guns, two 70-mm. and two 75-mm. guns, ammunition, gasoline, oil, individual equipment, machinery, Ford and Chevrolet-type trucks, and two radars. They left stocks of rice, tea, hardtack, dried kelp, noodles, canned goods, and large quantities of beer and sake behind.29 The marines took over the abandoned weapons and used them to bolster their defenses. The 100-pound bags of rice and other food in the commissary dumps were added -to the marines' limited stores. The Japanese left among their personal belongings many diaries which were valuable sources of information for Allied intelligence. 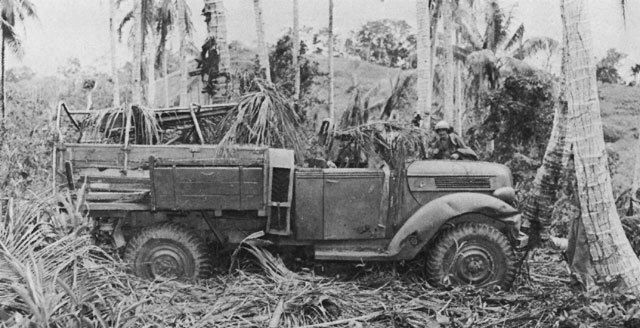 About thirty-five of the Japanese trucks were serviceable. Lighter than American military transport, they proved less efficient. 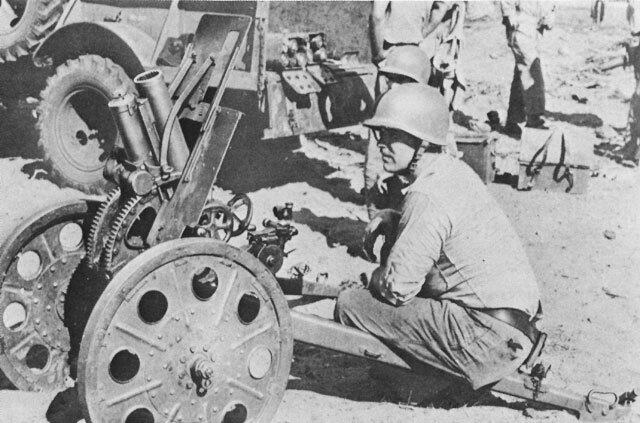 Without powered front axles, they stuck easily, but were a valuable addition to the 1st Marine Division's limited motor transport, and were used as long as they held together. The division engineers also used the Japanese rollers, mixers, surveying equipment, gasoline locomotives, and hopper cars in the subsequent completion of the airfield. JAPANESE EQUIPMENT found in the Lunga Point area included many trucks such as the one above. The 70-mm. gun shown below was one of many weapons abandoned as the enemy retreated westward to new positions. Tactical operations had proceeded favorably. The Guadalcanal forces had landed unopposed and captured the airfield without casualties. In the Tulagi-Gavutu-Tanambogo area, all objectives had been taken at the cost of 144 killed and 194 wounded, while the defending garrisons had been destroyed. By 9 August, 10,900 troops had landed on Guadalcanal, and 6,075 on Tulagi.30 To support the infantry, 3 field artillery battalions, with 3 units of fire, plus special weapons, tanks, tank destroyers, and part of the 3d Defense Battalion, had landed on Guadalcanal, while the 3d Battalion, 10th Marines (75-mm. pack howitzers), and part of the 3d Defense Battalion had landed on Tulagi. Unloading the landing boats proved to be an exhausting and almost impossible job, for so many of them lacked movable bow ramps which could be let down to speed the removal of supplies from the boats. The pioneers had to lift the supplies up and over the gunwales to unload them. On the other hand, the unarmored amphibian tractors "demonstrated a usefulness exceeding all expectations. "32 Used as an ambulance, a prime mover, and an ammunition carrier, the amphibian tractor, later to play such an important tactical role in the Pacific, was able to move directly from ship's side to inland dump, easily traversing the sea, reefs, beaches, and swamps without halting. But there were only a few amphibian tractors. SUPPLIES ACCUMULATING AT RED BEACH presented this scene of confusion the morning of 8 August. 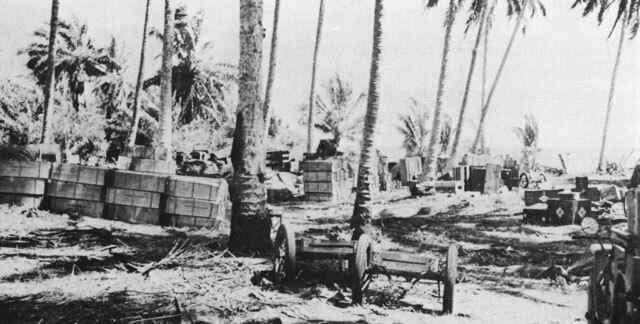 Stacks of ammunition were dangerously piled with other supplies and gear under the palms to clear the beach for further unloading operations. ENEMY AIR ATTACKS ON THE TRANSPORTS forced a delay in unloading operations, but caused only light damage 7 August. This Japanese Mitsubishi "Hap" was flying fighter cover for the aircraft whose bombs are seen exploding off the stern of the transport. White streaks are wakes of landing craft scattering for safety. Enemy air attacks also delayed unloading operations. 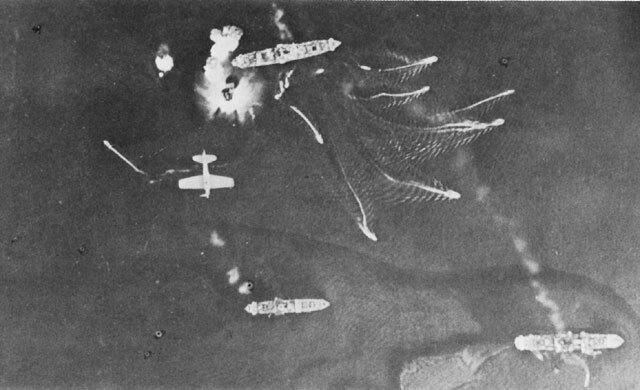 Twenty-five twin-engined Japanese bombers from Rabaul attacked the ships in the early afternoon of 7 August. Several planes were shot down by the covering fighters and gunfire from the transports and screening warships. The Bougainville coastwatcher had warned the Allied ships in time so that none were hit,35 but the transports had been obliged to cease unloading and get underway. About one hour later, a second wave of Japanese bombers drove the transports off again and damaged the destroyer Mugford. The Japanese aircraft fortunately did not attack the gear which crowded the beach, but three hours of unloading time had been lost. By nightfall on 7 August 100 landing craft were beached, waiting to be unloaded, while an additional 50, unable to find landing room on the beach, stood offshore. Unloading was continued into the night, but the tired shore party could not cope with its task and operations broke down completely. At 2330 the shore party commander, stating that unloading was "entirely out of hand," requested that the ships cease discharging cargo until moo, 8 August, when he estimated the beach would be cleared. Admiral Turner and General Vandegrift assented. burned until she was a total loss. The Jarvis left for Noumea but was never heard from again. A false air alarm later in the afternoon forced the ships to get underway once more. The Japanese garrisons on Guadalcanal and in the Tulagi area had not been able to resist the American attack effectively, although an enemy report claimed that ten transports and the greater part of the escorting naval forces had been destroyed.36 The air attacks on 7-8 August had not seriously damaged the Amphibious Force, but they had caused serious delays in unloading. These were only preliminaries, however, to the heavy blow the Japanese were preparing to deliver. Five heavy and two light cruisers and one destroyer assembled in St. George's Channel off Rabaul on the morning of 8 August with orders to attack the American transports in Sealark Channel.37 This force sailed south along the east coast of Bougainville until sighted by an Allied patrol plane from the Southwest Pacific Area, which radioed a warning to Melbourne. The Japanese ships then reversed their course for a time, but after the plane departed, turned west through Bougainville Strait and then south through the narrow waters (the "Slot") between the two chains of the Solomons. At 1800 on 8 August, Admiral Turner received word that the Japanese force was approaching.38 The Screening Force, augmented by the fire support warships, was then covering the northern approaches to Sealark Channel. Two destroyers, the Ralph Talbot and the Blue, were posted northwest of Savo Island on either side of the channel to maintain watch by radar. Three cruisers, the Australia, Canberra, and Chicago, and the destroyers Bagley and Patterson, were patrolling the waters between Savo and Cape Esperance. The cruisers Vincennes, Astoria, and Quincy and the destroyers Helm and Wilson patrolled between Savo and Florida. Two cruisers, screened by destroyers, covered the transports. was about to be withdrawn. Two days of enemy air action and operational losses had reduced fighter strength from ninety-nine to seventy-eight planes. Fuel was running low. Admiral Fletcher, commanding Task Force 61, was worried by the numbers of enemy bombers operating in the area. At 1807, 8 August, he asked Admiral Ghormley for permission to withdraw his carriers.39 Admiral Ghormley consented. 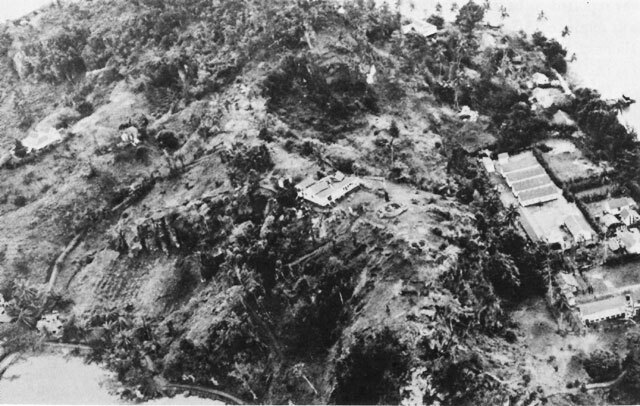 The force would be withdrawn, he announced, until enough land-based aircraft to protect the line of communications to Guadalcanal could be assembled, and until sufficient stocks of aviation fuel could be maintained at Guadalcanal to support fighter and bomber operations.40 The carrier forces retired southward early the next morning. When informed that the carrier forces were to be withdrawn, Admiral Turner called General Vandegrift and Admiral Crutchley aboard the flagship McCawley.41 General Vandegrift left his command post at the mouth of the Ilu River to board the McCawley about 2325, 8 August. Admiral Crutchley took the flagship Australia out of the Screening Force and sailed aboard her to the McCawley to attend the conference. Turner informed them that the imminent retirement of the carriers would leave the Amphibious Force without effective air protection and that he had decided to withdraw the ships of the Amphibious Force at 0600 the next morning. General Vandegrift was seriously disturbed by this news. The retirement of the ships, he felt, would place his division in a "most alarming" position.42 Unloading of supplies at Tulagi had not even started at 7 August because the Japanese had held so much of the island.43 The 1st Marine Division's plans were based on the assumption that the transports would remain offshore until 11 August, and by the night of 8-9 August more than half the supplies embarked by the division still remained in the ships' holds. search for the American and Australian ships.44 About midnight of 8 August the Allied ships in the channel reported that unidentified aircraft were overhead. About 0145, 9 August, a seaplane from the Japanese cruiser Chokai dropped flares over the transports, while the Japanese warships slipped unobserved past the Ralph Talbot and the Blue. After passing the destroyers, the Japanese sighted the Allied ships between Savo and Cape Esperance. Still undetected, they fired torpedoes which struck the Chicago and the Canberra. After this attack the Japanese left to strike the American ships between Savo and Florida. They illuminated their targets briefly with searchlights, then put heavy fire into the American cruisers. Unwilling to risk further action with the Allied cruisers and fearful that American aircraft might attack his ships at daylight, the Japanese commander then led his force northward away from Savo. 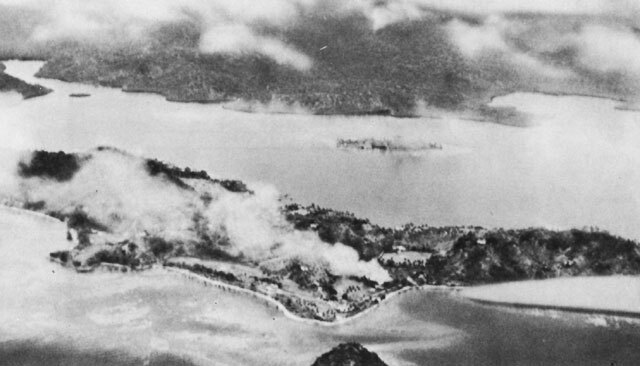 On the morning of 9 August the Japanese force reached Rabaul. The next day, off New Ireland, the cruiser Kako was sunk by torpedoes from an American submarine. The Battle of Savo Island was one of the worst defeats ever suffered by ships of the U. S. Navy. The enemy had taken them by surprise and defeated in detail the two forces on either side of Savo. The only enemy ship damaged was the Chokai, whose operations room was destroyed. The Vincennes and Quincy sank within one hour after being attacked. The badly hit Canberra burned all night and was torpedoed by American destroyers the next morning to sink her prior to the departure of the Amphibious Force. The severely battered cruiser Astoria sank about midday on 9 August. The Chicago and the Ralph Talbot had both been damaged. Fortunately the Japanese commander had lacked sufficient daring to execute his orders to attack the weakly defended transports in Sealark Channel.45 Had he done so, he could have effectively halted Allied operations in the South Pacific and completely cut off the 1st Marine Division from reinforcement and supply, for all the transports and cargo ships of the South Pacific Force were present in Sealark Channel. Supplies for these men were limited. Of the sixty days' supplies and ten units of fire with which the division had embarked, less than half had been unloaded. There were about four units of fire available on Guadalcanal and Tulagi. Guadalcanal had 6,000,000 rounds of .30-caliber ammunition, and 800 90-mm. shells.49 Food stocks were low. When an inventory was completed about 15 August, it was found that food for only thirty days was on hand--B rations for seventeen days, C rations for three days, and Japanese rations for ten days. Troop rations were reduced to two daily meals. Hist USAFISPA, Pt. I, I, 85. 11th Bomb Gp (H) Hist, p. 6. Rads, COMGENSOPAC to WDCSA, CM-IN-3200, 4 Aug, and CM-IN-5391, 14 Aug 42. COMAMPHIBFORSOPAC War Diary, 6-7 Aug 42. 1st Mar Div Rpt, I, 9. 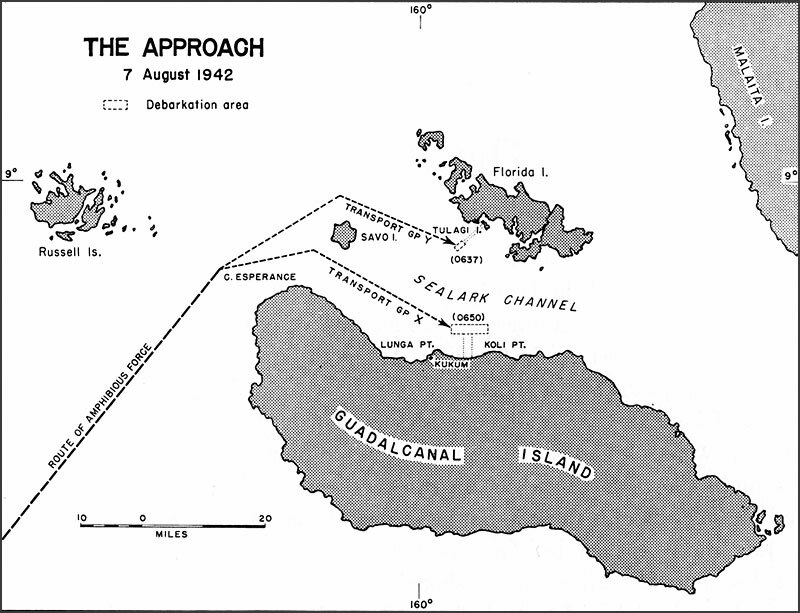 CTG 62.1 SOPACFOR: Rpt Action Guadalcanal-Tulagi Area, Solomon Islands, Aug 7-8 and 9, 1942, Ser 0027, 23 Sep 43, P. 3. This report is filed in the Office of Naval Records and Library. COMAMPHIBFORSOPAC War Diary, 7 Aug 42. 1st Mar Div Rpt, II, Annex N (1st Mar Div D-3 journal), I. Landing in the Solomons, p. 10. Hist Sec, Hq, USMC: The Guadalcanal Campaign: August 1942 to February 1943 (June 1945), p. 14. Flame throwers were not then in use. General Vandegrift wrote that they would have been "practical and effective," and recommended dive bombing with depth charges. 1st Mar Div Rpt, II, 8. COMAMPHIBFORSOPAC War Diary, 8 Aug 42. 1st Mar Div Rpt, II, 4. Rpt, Asst Div Comdr 1st Mar Div to CG 1st Mar Div, 1714, 8 Aug 42, in 1st Mar Div Rpt, II, Annex B; Ltr, Col John M. Arthur to Hist Sec, Hq, USMC, 11 Oct 45, in files of USMC Hist Sec. The 1st Marine Division had objected to this use for liaison planes on the ground that they might easily have been shot down, and because smoke is not good for marking beaches. 1st Mar Div Rpt, II, 15, and Avn Annex K.
 1st Mar Div Rpt, II, Annex L (5th Mar Record of Events, 7 Aug 42), I. 1st Mar Div Rpt, II, 1. 1st Mar Div Rpt, II, Arty Annex I, 1. Interv, AGF Mil Obs, SWPA, with CG 11th Mar and ExO 11th Mar, 19 Dec 42, included as App to Rpt, Mil Obs, SWPA, to CG AGF, 20 Sep-Dec 42, 2 Jan 43. OPD 381 SWPA Sec. II Case 108. 1st Mar Div Rpt, II, Annex M (1st Mar Hist), 2. 1st Mar Div Rpt, II, 10. Ltr, CG 1st May Div to Comdt Mar Corps, 1 Jul 43, sub: Final Rpt Guadalcanal Opn. 1st Mar Div Rpt, II, 18; Int Annex G, 2. 1st Mar Div Rpt, II, Avn Annex K.
 COMSOPAC to COMINCH, 1400 of 13 Aug 42. SOPAC War Diary. 1st Mar Div Rpt, II, 12. Ibid., Int Annex G, 8. COMAMPHIBFORSOPAC War Diary, 9 Aug 42. 1st Mar Div Rpt, II, 16. 1st Mar Div Rpt, II, 11. General Vandegrift suggested using 1,500 in a division unloading party. Feldt, op. cit., pp. 88-89. ATIS, SWPA: Int Rpts, Yazawa Butai Hq and Oki Shudan (17th Army) Gp Hq, 8 Mar-30 Sep 42: Enemy Publication No. 28, 21 Jul 43, p. 50. USSBS, The Campaigns of the Pacific War (GPO, Washington, 1946), p. 106; Interrogations, I, 255-56. COMAMPHIBFORSOPAC War Diary, 8 Aug 42. The warning stated that three cruisers, two destroyers, and two gunboats or seaplane tenders were approaching. CTF 61 to COMSOPAC, 0707 of 8 Aug 42. SOPAC War Diary. For fuller accounts of the naval aspects of these operations, see ONI, USN, Combat Narratives: Solomon Islands Campaign. I, The Landing in the Solomons, and II, The Battle of Savo Island, 9 August 1942 (Washington, 1943) relate to the operations described in this chapter. COMSOPAC to CINCPAC, 0834 of 9 Aug 42. SOPAC War Diary. 1st Mar Div Rpt, II, 13. CTF 62.6 (Rear Adm V. A. C. Crutchley), Rpt Battle Savo Island, 8-9 Aug 42, Ser 231, 6 Apr 43, 16. A photostatic copy of this report is in the Office of Naval Records and Library. CTF 62 to CTF 61, COMSOPAC, COMAIRSOPAC, 0508 and 0725 of 9 Aug 42. SOPAC War Diary. CO 2d Mar to COMSOPAC, CINCPAC, CTF 62, and COMSOWESPAC, 1400 of 12 Aug 42. SOPAC War Diary. COMAMPHIBFORSOPAC War Diary, 9 Aug 42; 1st Marine Division Report does not give exact figures. Rad Noumea to rad Tulagi, 0640 of 14 Aug 42. SOPAC War Diary. 1st Mar Div Rpt, II, Annex K, 1. Messages from commanding general of the 1st Marine Division in SOPAC War Diary in August, September, and October 1942 report enemy air raids and naval bombardments almost daily.